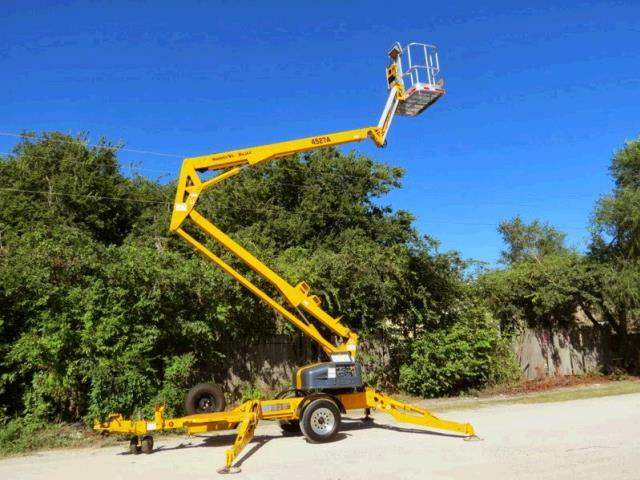 Towable, battery powered 45' Man-lift. Automatic, self-leveling hydraulic outriggers up to 12.5 degrees. 2 Person Work Platform. 500 lb. Maximum Capacity. Air, Water, and 110 Volt lines available to the platform. Weighs 4,200 lbs. Requires 1/2 Ton Pickup with 2" ball hitch. Lift is quipped with hydraulic surge brakes. - 27 ft. Maximum side reach from center of lift. - 21 ft. Maximum side reach from edge of outriggers. - 500 lb. Platform capacity, 2 persons. - 12' 4 in X 11 ft. 4 in. -Outrigger footprint during operation. - Length 19 ft. 6 in. - Width 5 ft. 6 in. - Height 6 ft. 5 in. 24 volt battery/hydraulic for quiet and dependable operation. Safety Harness is furnished for your safety. 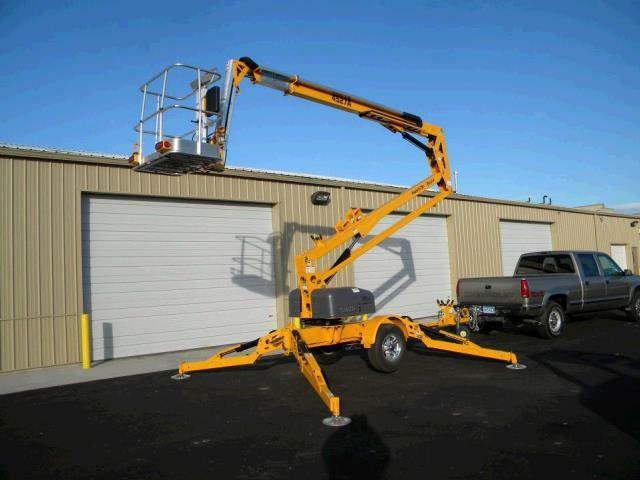 * Please call us with any questions about our manlift 45 foot tow biljax 4527 24 v rentals in Oak Grove MO, Blue Springs MO, Independence MO, Lexington MO, Odessa MO, Independence MO and Western Missouri.